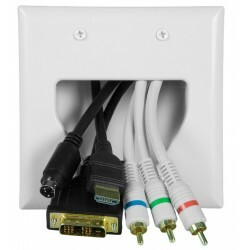 Tunnel allows completely flush mount in tight spaces. Double gang, standard US electrical box. Recessed opening directs cables at a 90° angle, without protruding. Perfect for routing pre-terminated cables through a wall.